As the fastest-growing storage start-up in history, it's no surprise that there's a big buzz around Nexenta® nowadays. Nexenta has been acclaimed by critics for many different aspects of our company. We have been recognized not only for excellence in producing storage software, but also for excellence in our partner channel and in our performance as a business. CRN has recognized Nexenta as a finalist in the 2018 CRN Tech Innovator Awards for their latest product NexentaCloud in AWS. Nexenta has been recognized in the Channel Company’s annual CRN Data Center 100 list, featuring technology vendors whose solutions are vital to today’s data centers. CRN, a brand of The Channel Company, has named Nexenta to its 2018 Software-Defined Data Center 50 list. The list recognizes companies that are teaming with solution providers to give dramatic advances in data center compute, storage and network automation and intelligence. The 2018 Software-Defined Data Center 50 is based on ongoing feedback throughout the year from solution providers on the strength of the vendors’ technology portfolio, channel influence, effectiveness and visibility, along with business and sales impact on the channel. CRN®, a brand of The Channel Company, has recognized Nexenta in its 2016 Cloud Computing Partner Program Guide. Nexenta is a ‘Storage Vendor of the Year’ Finalist. NexentaEdge won in the “New Product or Service of the Year - Software - Cloud Storage & Backup Solution” category. Tarkan Maner, Chairman and CEO, won in the “Executive of the Year - Computer Services & Software - Up to 500 Employees” category. Nexenta won for NexentaStor, the award is presented by Cloud Computing magazine, which recognizes companies that have most effectively leveraged cloud computing in their efforts to bring new, differentiated offerings to market. Nexenta won for powering and supporting the benefits of virtualization across all parts of the IT infrastructure. Nexenta won Software Vendor of the Year at the European IT & Software Excellence awards for its strong channel support. 2014 CRN’s Tech Innovator Winner in Two Categories! Cloud Computing Magazine, published by TMC, announced that NexentaEdge has won their 2014 Cloud Computing Storage Excellence Award. The award recognizes companies who provide unsurpassed cloud storage solutions with the highest levels of efficiency and performance for their customers. Cloud Computing Magazine judges said they were impressed by NexentaEdge and expressed their view that it is an important development that clearly makes Nexenta a verifiable leader in the marketplace. Nexenta, as a leading developer of disruptive technologies for forward-looking enterprises, was awarded the 2014 Grand Pillar Award for its overall leadership in product innovations in 2014, recognizing the significant updates to existing products, NexentStor and NexentaConnect for Horizon, as well as the release of three new innovative products announced during the year. 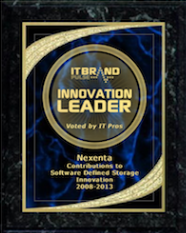 In addition to recognizing the company with this great honor, NexentStor v.4 was awarded the highest honor of a Gold Medal in the category of Storage Software Innovations, recognizing its impact on the market with a feature rich solution that drives new economics in the competitive storage market. Network Products Guide, the industry's leading technology research and advisory guide, has named Nexenta's NexentaStor a Gold Winner for the 9th Annual 2014 Hot Companies and Best Products Awards in the "Hot Technologies" category. Nexenta won the ‘Big Data Company of the Year’ award at The Storage Awards 2014. The annual event offers readers of Storage Magazine (UK) the chance to reward outstanding and innovative products, services and people. The win for Nexenta illustrates how businesses of all sizes are realising the undeniable benefits of using its Software-Defined Storage solutions to support their growing data challenges. The CIO Storage20 is an annual award listing the most promising storage companies. A panel of CEOs, CIOs, industry analysts and the CIO Review editorial board selected Nexenta as a company tackling the most pressing storage challenges based on value and impact in the marketplace. The Storage Visions Conference Awards are presented to firms that advance the state of the art in storage technologies utilized in consumer electronics, and in the media and entertainment industries, and to service firms that support those businesses. The Tech Success Awards are an initiative of TechWeekEurope, a leading technology news and advice website. The Storage, Virtualization, and Cloud awards reward the products, projects and services as well as honor companies and teams operating in the cloud, virtualization and storage sectors. They recognize the achievements of end-users, channel partners and vendors alike. The AlwaysOn Global 250 awards are given every year to the top private technology companies who are combining infrastructure and software innovations to create an interconnected global technology community. Nexenta was named to CRN's 2012 Partner Program Guide and was awarded the highest possible rating of a CR 5-Star Partner. This rating is the definitive listing of manufacturers and software publishers that service solution providers or provide products to the IT Channel. The Execullence Award was created to give industry insiders — the attendees at ExecEvent — a way to recognize and choose companies and technologies that stand out amongst their peers. The Golden Bridge Awards are the world's premiere business awards and were created to honor and generate industry-wide peer recognition of the achievements and positive contributions of organizations and individuals from all over the world. Nexenta was awarded a Silver Stevie® in recognition of our unbelievably-fast growth. The Stevie Awards for International Business were started to raise the profile of exemplary organizations and individuals among the press, the business community, and the general public, which has made the Stevie one of the world's most coveted awards. The Techworld Awards have firmly established themselves as the major infrastructure and networking awards event in the IT calendar. Recognizing both products and users, the TechWorld Awards highlight innovation on all sides of the IT industry. This award comes from the industry-leading publication TMCNet, for NexentaStor, our flagship software product.